It's a very exciting time to be an operations researcher and analytics professional with so many fascinating problems to work on and to contribute to the solution of. I have been so lucky to have had and to continue to have such fabulous students, both graduate and undergraduate ones, as well as collaborators from around the globe. Much of our research is done through the Virtual Center of Supernetworks that I founded back in 2001. What makes me so proud is the successes of my students, both present and former! It's always a delight to receive email messages or a phone call in which they share with me their accomplishments and, of course, to also share good news face to face! Quite a few of my former PhD students are now Center Associates of the Supernetwork Center and, three times a year, we produce its newsletter - The Supernetwork Sentinel. 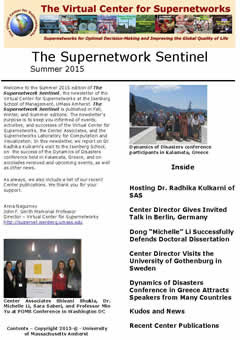 We are pleased to report that the Summer 2015 edition of The Supernetwork Sentinel is now online and it reports news from the Center since the Winter 2015 edition and until the beginning of July. The newsletter can be downloaded here from the Supernetwork Center website. All the editions of The Supernetwork Sentinel, going back to the Fall of 2003, can be accessed here. Collaborations are key to solving tough problems and I am so grateful for my wonderful Supernetwork Team. After spending multiple weeks in Europe this past summer, as a Visiting Professor in Sweden, and also speaking and attending plus co-organizing conferences in various countries, I am enjoying being in very green Amherst, Massachusetts. But, before long, I will be heading out again, to give a plenary talk in Bogota, Colombia. I will be speaking on Sustainable Supply Chains for Sustainable Cities. Reflecting back on the places that I had been recently what stood out in my mind is the importance of green spaces in cities. The New York Times recently even had an article on a scientific study on the effects of walking in nature on people's brains. I must admit that in traveling I always try to locate a hotel close to a park. Below are photos of green spaces in some of my favorite cities. Take in the beauty and enjoy - it may even be good for your health. And, of course, Central Park in New York City! I returned last night from Europe where I spent the last 3 weeks at 3 different conferences and transiting between them. During this period I was privy not only to major current events but also history in the making since I was in Greece during the financial crisis (and ultimate bailout) and even in Vienna where US Secretary of State John Kerry helped in the successful Iran nuclear negotiations. This past week, I had the pleasure of taking part in the EURO 2015 conference in Glasgow, Scotland, which I have blogged about, and, on Tuesday, I was privileged to hear Professor Alan Wilson of the University College London deliver his keynote talk on the Future of Cities in the beautiful Barony Hall, which was packed. He is the Professor of Urban Regional Systems. His extensive, wide-ranging contributions are both in research as well as in administration. Sir Wilson began his talk by stating that "he secretly thought that he always was an Operations Researcher," and then stated that he is an Operations Researcher. Coincidentally, I know of his work through Regional Science and both Sir Alan Wilson and I were elected Fellows of the RSAI (Regional Science Association International) in the same year - in 2007! Sir Wilson's passion is cities, since he is concerned with the biggest of big problems. I so much enjoyed his plenary talk in which in emphasized nonlinearities, complex systems, and the high level of interdependencies in cities (just think of population and infrastructure, for example). He also emphasized the importance of transportation and networks and how infrastructur ties issues of population with the economics of cities. He stated that his view as a math modeler is "to explore different futures for cities." In his plenary, he also mentioned the role of engineers in transportation planning in the US so I have to note again the recent book by Professors David Boyce (who is both an INFORMS Fellow and an RSAI Fellow) and Huw Williams, Forecasting Urban Travel, which I have written about on this blog. You can view Professor Boyce's presentation on 60 years of travel demand forecasting in which he notes the work of Alan Wilson here. Those of you who were listening closely to Sir Alan Wilson's plenary lecture, may have heard him mention Professor Suzanne Evans. Back in 2003, at a Regional Science conference, Suzanne Evans, joined me, Professor David Boyce, and Hani S. Mahmassani (well-known in transportation science and OR ) on a panel to commemorate the 50th anniversary of the publication of the network classic, Studies in the Economics of Transportation, by Beckmann (who was on my dissertation committee at Brown University), McGuire, and Winsten. You can see photos and presentation if you scroll down on this page. Sir Wilson, in his ketnte, emphasized 6 challenges of cities in the United Kingdom, and stated that the challenges also apply to other cities and I agree. Specifically, he noted the challenges as being: people (demography), city economcs, the environment and sustainability, urban form (land use and green belts, which I am so passionate about), infrastructure, and governance. He noted that the UK is very centralized and cities are pushing for more decentralization and autonomy. As a math modeller, Wilson emphasized the high dimensionality of the problems associated with cities and discussed various scenarios for the future of London with powerful graphical displays. One scenario was what would happen if "we killed off the car." Since I have done a lot of work on projected dynamical systems, I enjoyed hearing him speak about Lotka-Volterra dynamics (and relationships even to retail and hospitals), path dependence on initial conditions, forecasting challenges, and the importance of capturing uncertainty in dynamics. And, since I had been in London, just a few days before travelinng to Edinburgh and then Glasgow, I have to include in this post one of my favorite green spaces in a city - Hyde Park in London. Many thanks to the organizers of the great EURO conference in Glasgow for bringing to us such outstanding plenary speakers and many other presenters. It was an honor and delight to take part in it! We arrived in Glasgow, Scotland, this past weekend, to attend and speak at the EURO 2015 conference, which has 2,300 operations research delegates from around the world. This is the biggest conference ever held in Glasgow and I was reminded of EURO 2006, which was in Reykljaik, Iceland, with 700 delegates and the biggest scientific conference there to that date. Frankly, the climate is not so different between the two but with more rain in Glasgow. We were greeted, when we disembarked from the train from Edinburgh, by welcome banners in George Square. The University of Strathclyde is the site and organizer of this fabulous conference. The registration at the Innovation Centre with so many student helpers in red t-shirts was very efficient. The assistants have been very helpful with providing directions and answering questions throughout the conference. The emphasis on customer service has been extraordinary everywhere in Glasgow and Scotland that we have been. Queen Elizabeth and the Duke of Edinburgh had recently dedicated the Innovation Centre. One of the first colleagues that I saw was Professor Panos M. Pardalos of the University of Florida, with whom I co-organized the Dynamics of Disasters conference in Kalamata, Greece, just two weeks ago (and we also connected in Edinburgh last week). The first day of the conference was jam-packed. In the afternoon, my former PhD student at the Isenberg School, Dr, Amir Masoumi of Manhattan College, delivered our integrated disaster relief paper in a session organized by Professor Tina Wakolbinger of the Vienna University of Economics and Business (who also was my PhD student). Our paper is joint with Professor Min Yu of the University of Portland (another very successful former student of mine). The paper was recently published in an edited volume that includes a paper by the Nobel Laureate in Economic Sciences Paul Krugman. Then it was time to run to a session organized by my long-time collaborator and Supernetwork Center Associate, Professor Patrizia Daniele of the University of Catania in Italy. Her session was on equilibrium problems and variational inequalities and I spoke in it on our ecolabelling and fashion supply chain research with Professor Jonas Floden of the University of Gothenburg and also Min Yu. We even took a group photo of the session participants. 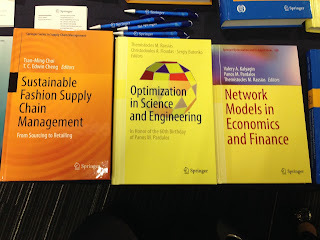 And, amazingly, the fashion supply chain paper that I presented was just published in a book by Springer, which was on display at the conference! Below I am with Christian Raucher of Springer. At the exhibit were several books that I had chapters published in. Another high point (so far) was listening to Professor Terry Rockafellar (since retiring from the University of Washington he has joined the University of Florida) give a plenary talk on his latest work on risk, which is brilliant. He also gave a talk the same day in another session organized by Patrizia Daniele! This is stamina and operations researchers have it. After such an exciting day filled with great talks and reconnecting with colleagues and friends who had traveled to Glasgow, we convened a group for dinner, which included 3 of my former Isenberg PhD students (Wakolbinger, Masoumi, and Toyasaki), Professor Patrizia Daniele, Professor Monica Cojocaru, Professor Laura Scrimali, Professor Giancarlo Bigi, Professor Mauro Pssacantando, and my husband, Professor Ladimer S. Nagurney, at Amarone (which we had also eaten at in Edinburgh and enjoyed very much). EURO 2015 also is serving as a great venue for a reunion of 5 Supernetwork Center Associates. And both Professors Wakolbinger and Toyasaki also took part in our Dynamics of Disasters conference! And, after all the great food that we have been consuming, what can be better than walking the Flasgow Green! I am spending 3 weeks in Europe engaged in some very serious conference" chaining." I have been blogging from different countries, beginning with Greece, where the Dynamics of Disasters conference that I co-organized with Professors Pardalos and Kotsireas took place in Kalamata. Today we will be taking the train from Edinburgh to Glasgow, where the EURO 2015 conference will begin tomorrow. While in majestic Edinburgh, which is breathtakig with its architecture (including the Edinburgh Castle), greenery of the Meadows, stunning shops, multiple modes of transport (we arrived from London via Virgin Trains), and the conviviality of the people of Scotland. The food, I might add, has also been so delicious! Of course, I would be remiss not to mention the great writers from this area, including for all the Harry Potter fans out there, J.K. Rowlings, and the cafe in which she did much of her writing of the first books. Also, Sir Artur Conan Doyle, the author of the Sherlock Holmes books, also write in Edinburgh. The photo above was taken in front of the cathedral prior to a ceremony marking the 20th anniversary of the massacre at Srebrenica. I was in Edinburgh to attend the EUROPT Workshop on Continuous Optimization. It was great to see Panos Pardalos again who is also en route to EURO Glasgow. 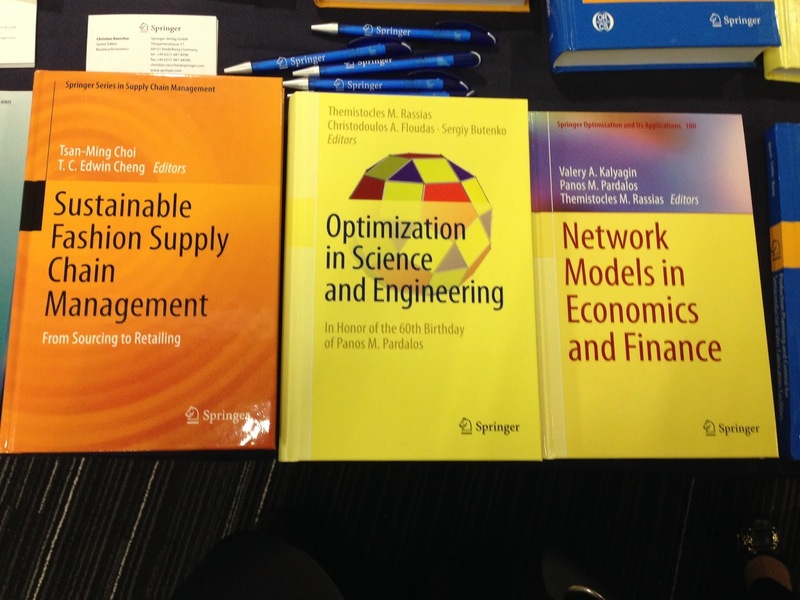 I got a chance to enjoy some excellent talks, including a talk on closed loop supply chains in which several of my publications and my Network Economics book were noted. The finance risk sessions was also very good and the energy talks also very interesting. I could relate to these since my supernetwork team has done a lot of work on risk and supply chains and also electric power supply chains, even with data for all of New England! Below are some photos taken at the great workshop. Special thanks to professor Julian Hall at the University of Edinburgh for being so responsive to my questions!